Metal roofs are a great addition to any home or commercial property, ranging in versatility from chic and stylish to rustic and efficient. We offer installation, repair and replacement services on metal roofs on all types of buildings, and we even give free estimates. Call us now to schedule an appointment with one of the roofers on our team! One of the best qualities about a metal roof is the fact that they can last a lifetime when well-maintained. There are very few roof types that can offer that kind of service, the main contender being the tile roof, which has a much higher cost to install and maintain. There are also many homes and properties that aren’t set up structurally to handle the additional weight a tile roof brings; however, our roofers can create a metal roof in all sorts of styles, including metal tiles, that can replicate many other looks and please any taste. Many homes, both traditional and modern are making the switch to metal roofs. Not only can they be done in virtually any color, and any style, but they also are extremely low-maintenance and resistant to nearly all natural dangers. Metal roofs are nearly always fully fireproof, they are generally resistive to high winds and impervious to most debris and other risks. Our roofing contractors install and replace metal roofs, so whether you’re looking to get one in for the first time, or your existing one is ready for a facelift, give us a call! Though they have many benefits, metal roofs are not, like any other type of roof, perfect. They can be damaged by strong forces, including hail. While many homeowners actually like the markings left behind from hail, as it can give it a custom and unique look, we are here to perform whatever metal roof repair your building needs. If you have an emergency, call us any time of day for quick service! Whether you’re looking to replace an existing roof with a metal one, or you already have a metal roof and are ready for a new one, just call us. Our roofing contractors are highly experienced, with over 40 years in the business, and can handle any and all of your roofing needs. We can also handle metal roof coatings, which can often seriously and dramatically increase the lifespan and service of your existing roof, without the same time, money or work that gets invested into a full replacement. If you’ve got problems with your current roof, call us to get it fixed the right way the first time around! 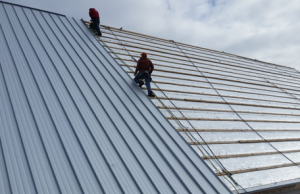 Need work done on your metal roof? We repair, replace and install metal roofs in Bentonville, Springdale, Fayetteville and all of the nearby areas. We are a local, veteran-owned roofing company that has over four decades of experience. We take our customers seriously, and we work hard to give you the best service you’ll find for our affordable rates. If you need repair, replacement or installation services for your roof, call us!